Looking to find the best diet for your dog? Want to know how other owners are getting on with particular dog food brands? Welcome to K9 Magazine's dog food reviews archive. Here we list the reviews and ratings for the dog food products that have been put through their paces by the K9 Magazine product testing panel (most of which you'll be pleased to hear have a leg on each corner and a tail at the back!). Our dog food reviews are submitted by dog owners and product samplers. Some of the dog food reviews we feature are from dog owners who have used particular brands of dog food for a long time and others are the result of short term tests. We try to make this clear within the reviews themselves. Can These Dog Treats Motivate Even the Most Un-Treat Motivated Dog? Choosing The Right Dog Food - What Does Your Dog Need? 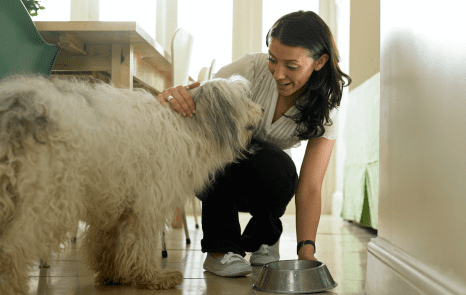 Dog Food: How Much is Too Much? Premium Quality Dog Food - Is It Worth The Extra Money? Putting Natural Instinct Dog Food to the Test: Can It Help This Dog Lose Weight? These New Dog Treats Have Just Hit the Streets, but How Good Are They for Your Dog?